Today I have chosen to highlight three cards I created using woven paper strips. They are very different from each other but for all of them I started by cutting paper strips. 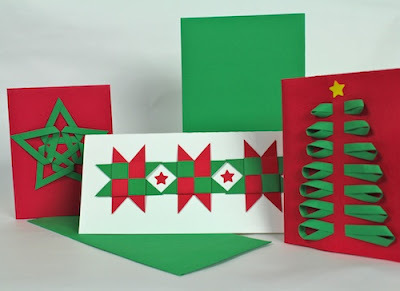 For this design I cut 1/4" strips of green paper and threaded them through slits in the red card. I then bent the loop back on itself in a bend that resembles a shirt collar. I hooked it back into the slit on the red card. I created the tree by making the loops different lengths. This design was a problem to mail because I didn't want the loops to get crushed. I first learned about Froebel Stars while in college and I have woven many over the years. My first college Christmas tree was covered in them. 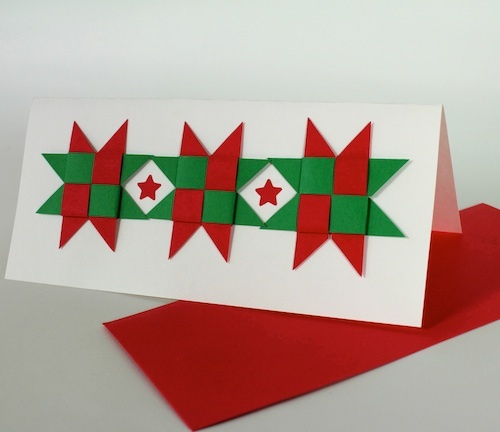 In my card design for 2003 I made 8 point Froeble stars. It is all of the steps up to the part where you start adding the three dimensional points. I stopped there and cut off the extra paper. I chose to keep these flat because of the mailing issues. 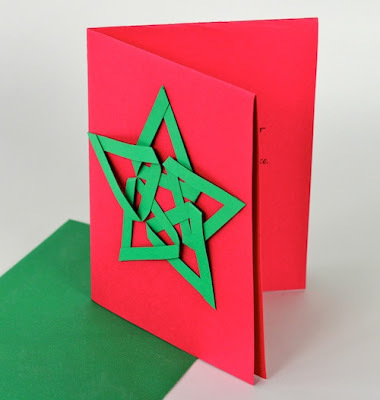 The steps for making these stars are peppered through out the web but here is one site that has used colored strips to help make the directions clear. 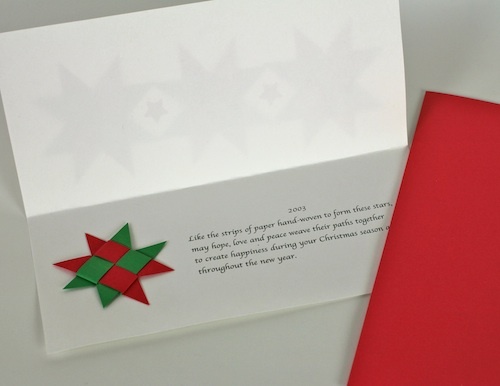 The card cover had 3 Froeble stars which I glued in a line and then placed punched stars in between. I had started by wanting to make a quilt inspired design. You can see the essence of a patchwork pattern in the design. 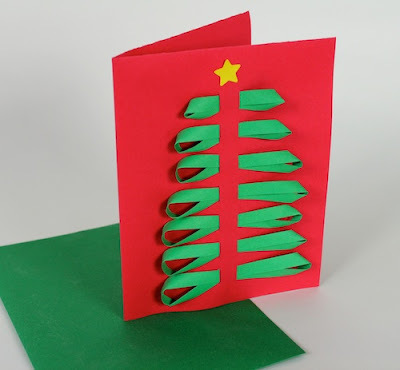 Some years I carry the theme to the inside of the card as well. This design was driven by my discovery of Glue Dots. I had not known about them and I developed a quick assembly line for creating these five-pointed stars. Just the tips are attached so there is a slight three-dimensionality in the design.